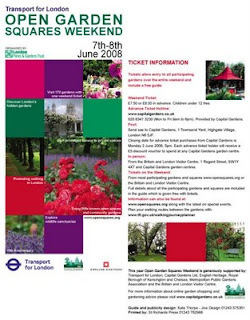 Durand Gardens is included in this year's Open Garden Squares weekend (13-14 June 2009). The scheme allows the public access to parks, squares and gardens not normally accessible. A visit to a single garden in the scheme will cost you £3, but a weekend pass to any of the 190 gardens available costs £8 during the weekend or £6.75 if bought in advance. More details on the Open Garden Squares website. Durand Gardens will be open from 10am to 5pm on both Saturday and Sunday. There will be refreshments and a small exhibition about the history of the Gardens.